Would you like to kick the tires of Oracle Application Express 3.2 on your own instance but do not have the spare hardware? Do you have 60 cents (USD)? Read on. Amazon has a service called the Elastic Compute Cloud (EC2) where you can fire up virtual machines in the cloud on a whim. They have partnered with other software vendors to provide images with pre-configured software. Oracle is one of those vendors and you can read about the offerings at the Oracle Cloud Computing Center on OTN. Oracle has an image which contains Enterprise Linux and Oracle Database 11g R1. The purpose of this post is to describe how I started an 11g R1 instance in the cloud, upgraded it to Application Express 3.2, and then completed the "Converting Your Oracle Forms Applications to Application Express 3.2" and "Utilizing Improved Security Enhancements in Application Express 3.2" Oracle By Example tutorials (OBEs). If you can spare 60 cents you may wish to try this yourself at home. First, you need to get your AWS account in order. Sign up for AWS at the previous link and then sign up for EC2. Review the EC2 pricing and then establish a payment method. If you already are a customer of Amazon.com you can choose one of the credit cards you have on file or establish a new one. Unfortunately, there is no infrastructure in place for you to insert two quarters and a dime for this test drive. Now you are going to need to get some software to startup an instance, manage it, and transfer files to it. Get the Elasticfox Firefox plug-in and review the Getting Started Guide. The Getting Started Guide will give detailed instructions on associating your AWS EC2 account with Elasticfox and also creating a KeyPair that you can use to identify yourself when connecting to the machine. You need to download Putty & PuttyGen to connect to your instance via SSH. 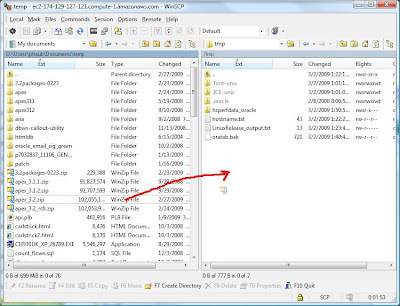 You should download WinSCP to transfer files to your instance. Finally you need to download Application Express 3.2. The keypair that you created when reviewing the Elasticfox Getting Started Guide needs to be converted to a format that can be used by Putty and WinSCP. You can use PuttyGen to create this key. Simply start PuttyGen, click load and browse to find the .pem keypair file you created with Elasticfox, then click Save private key to save it as a .ppk file. Figure 1, Creating a .ppk from your .pem with PuttyGen. You manage the instance by connecting via SSH and you can use Putty as the viewlet demonstrated. Before you can connect to the machine on port 22 from your computer you will have to specifically allow it from your IP address. In Elasticfox first identify the Security Group used to start the instance. It is most likely called "default" unless you added another Security Group. Click the Security Group tab, highlight default and then click the green checkmark under the Group Permissions pane to add a permission. You can either allow a specific host or a network range. 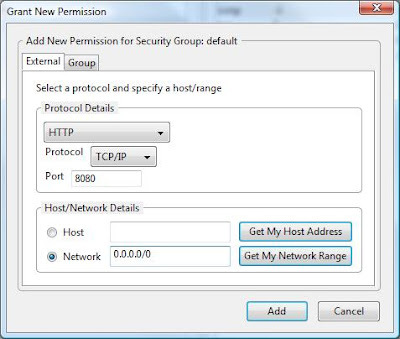 Allow your host to connect on port 22 and then create another permission to allow anyone to connect on port 8080 wich is the default port that EPG will be listening for HTTP requests. You choose Network and allow 0.0.0.0/0. 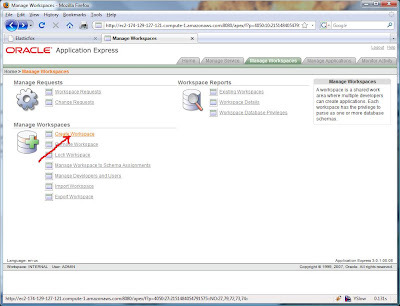 Login to Oracle Application Express and create a workspace. Now for the fun part. Start WinSCP and connect to your instance and copy apex_3.2.zip there. Figure 6, Application Express 3.2 in the Cloud! So there you have it. 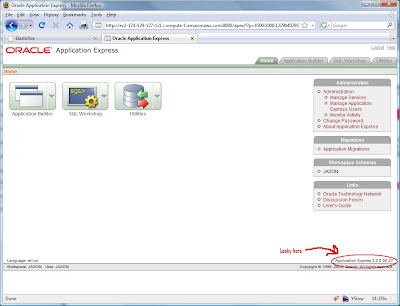 Test drive your own instance of Oracle Application Express 3.2 for around 60 cents (USD). For a limited time (until my manger finds out), you can try out my cloud instance using the following application linked below. I have configured my cloud instance to use the APEX Listener, which is a Java based HTTP listener that should release with the next version of Oracle Application Express. Licensing question for you. A, how is this licensed? Oracle is going to want their dollars per CPU - right? programs available on a processor metric. * 0.5 = 4 processor licenses (each virtual core is considered equivalent to a physical core). " Too much coin for my startup. I'll stick with GAE. But this is still cool that Oracle gets what is happening and is putting some effort and thought into this. I am working on getting the instance back up. I am not a licensing expert but you are right, it may be cost prohibitive to run a production application in the cloud if you don't already have the licenses. I think for development purposes, (the subject of this blog) I think the OTN license would apply. Also, nice job holding your finish on your golf swing. 20 cents an hour! Who's got that kind of dough?